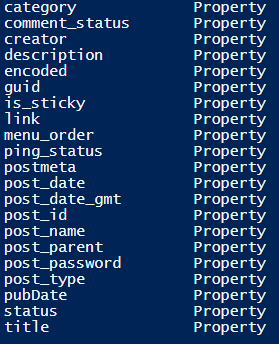 select-xml -xml $xmla -xpath "//channel/item" | select -expandproperty node | ? post_type -ne "attachment" | ? title -like "*Ramone*"
<blockquote>'On the '77 tour we had a day off and noticed Stonehenge was on the way'[URL <a href="http://books.google.co.uk/books? 4th June 1977, the Ramones visited Stonehenge. January 11th has been designated as World Sketchnote Day. Out of sheer perversity. I thought rather than doing a sketchnote, I thought I’d type something in plain text! A couple of people have asked about the way I do sketchnotes, so this seems like a good day to post it. I read the book – reading Mike Rohde’s ‘The Sketchnote Handbook’ is a big jump-start. It’s quick and fun to read and it’s a lovely book. I read it in a couple of hours. Any other words of wisdom I might have pale into insignificance besides ‘go and read Mike’s book‘. A4 paper – I now do all my Sketchnoting on plain A4 paper. It’s a good size for an hour’s talk, it’s cheap, it’s easy to scan and I don’t often run out of it. Squared paper – I created an A4 grid in Word and put the blank sheet on top of that. This makes the notes a bit less scruffy. Erasable ink – I use Uniball Frixion pens. I don’t rub much out, but it’s handy to be able to do so. Pencil doesn’t scan as well as ink. Agendas are useful – if I can find the slides for a talk I’ve found it useful to have the agenda handy, so that I know when the speaker has moved on to a new topic. No overdubs – I do 99% of the sketchnote-ing of talks live, in real-time. This is partly because I’m lazy, but it also means that any benefits I get from sketchnoting are essentially free. Apart from the time it takes to scan and post, the sketchnoting doesn’t take any extra time beyond the time I’m spending attending the talk. Visual vocabulary – Mike Rohde uses the phrase ‘visual vocabulary’ for the collection of things you can draw fairly quickly when you need to. Because I’m a bit of a nerd, I’m collecting these on a visual vocabulary page. The page is useful to remind myself how I’ve drawn things in the past…but I’m thinking I’m might convert it to something I can print on a couple of pieces of paper. ‘Learning’ from others – I’ve copied some ways of drawing things from other sketchnoters. I sometimes copy clip-art or icons or logos too. Webcasts are great – I do sometimes feel self-conscious sketchnoting at a conference. Webcasts avoid this issue! Tedtalks aren’t great – a lot of people practice sketchnoting Tedtalks with very good results. This doesn’t work so well for me. I’ve tried it a couple of times, but found I was continually re-winding the talk and hunting down stuff to sketch. A 20-minute talk took me getting on for two hours to sketchnote. And it still wasn’t finished. Not drawing the presenter – early on I used to do a sketch of the person who was doing the talk. This probably isn’t a good idea unless you’re a good artist and can make it flattering… or unless you know the presenter and know they won’t mind their appearance being reduced to, say, a bald head and glasses. Publishing – I started putting the sketchnotes on twitter as soon as I’d read the book. It didn’t seem good enough to publish, but if I’d waited until it did I’d have never shown it to anyone. I would do sketchnotes anyway, but I’ve gained a lot through putting them out there. I’m not very good at – color, drawing, different formats, not trying to capture everything. Practice – I do practice some of the drawings in odd moments when I have a pen and paper to hand. A lot of doodling is done in meetings! Also, sometimes while I’m sketchnoting I’ll try out, say, drawing a pig on a bit of scrap paper, before putting it into the sketchnote.